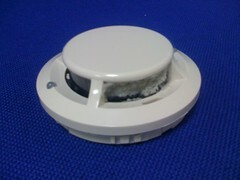 A smoke detector is a sensitive device designed to detect a fire from the by-products of combustion. You can read more about the operation of fire detection and alarm systems and smoke detectors in our popular series of articles titled "Principles of Fire Safety". Earlier today I received an email from CW (alias) who asked the question "what are the requirements for testing the sensitivity of collective smoke detectors in accordance with Australian Standard AS1851:2012?" While this article specifically considers the VESDA, there are other brands of aspirating smoke detector available that these general principes apply.